With just a month to go for the hosting of the Commonwealth Summit, the beautification of Colombo city is taking place at a rapid pace. Workers are busy paving the streets, equipment used for road repairs stand idly at different points in the city. 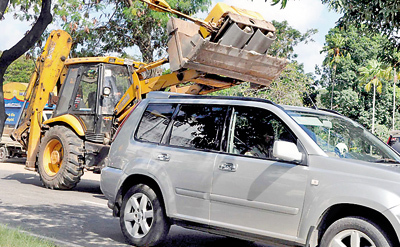 Huge vehicles used for road construction, parked carelessly along busy streets are common sights. 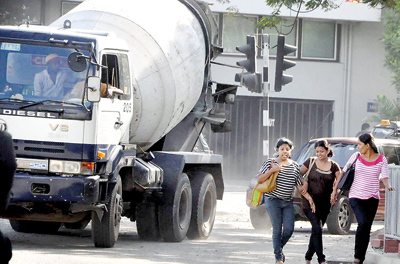 While everyone agrees on the need to give the city a facelift, pedestrians and motorists alike complain that traffic police have failed to control the traffic congestion caused by ongoing roadwork and minimise inconvenience caused to public. Daily, around 250,000 vehicles enter Colombo carrying over 800,000 passengers. “We do not have issues with the development work or the beautification process. But measures should be taken to reduce the traffic congestion. 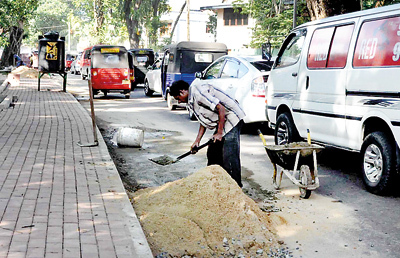 At present pedestrians walk on the road at the risk of their lives,” said Sriyani Hewage, a private sector employee who travels to Town Hall daily. Massive vehicles carelessly parked on busy streets can be seen at every nook and corner. S. Jinasena, a motorist said a few weeks ago, traffic police officers were seen at every nook and corner charging pedestrians who failed to use the zebra crossing and imposing fines for breaching traffic codes. However, since the road development work started, not a police officer is seen he said. “The duty of the traffic police is not merely to impose penalties on the public, but also to ensure the safety of road users,” he said.